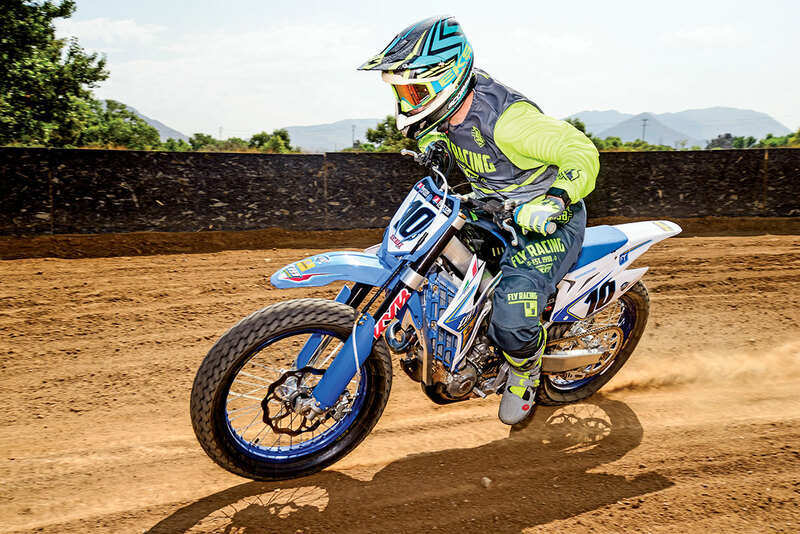 Flat-track technique does not come easy to the average moto guy. It takes years to perfect, and we definitely are in the early stages. Flat-track racing has been around in the United States since the early 20th century, with the American Motorcyclist Association (AMA) creating an A class or Pro class in 1932. Over the years this discipline of racing has been a staple in the two-wheeled racing scene with multiple manufacturers showing support, but surprisingly not many of them build complete race-ready machines. TM Racing, a small family-owned manufacturer based in Pesaro, Italy, changed all that a couple of years ago. Okay, to be fair, TM didn’t immediately jump straight into the Unlimited Pro class, which is ruled by big-displacement engines from manufacturers like Harley, Triumph, Indian, Ducati and the occasional Japanese manufacturer. They decided to take on the single-cylinder class that is mostly comprised of highly modified four-stroke motocross models from Japanese and European manufacturers. At a glance, the TM Racing 450FI Flat Track looks just like the other modified motocross bikes in the paddock, but looks can be deceiving. The triple clamp offset is unique to the TM Flat Track model. First introduced back in 2016, the small Italian company decided to develop its Flat Track model by racing the FIM Flat Track World Cup series that is held at locations throughout Europe. TM has a history of using racing to develop the next model year’s production motorcycle on the GP circuit, and the Flat Track model followed suit. TM will be the first to admit they learned a lot from the 2016/’17 racing season in which they won titles, and all that knowledge went straight into the 2018 model year. 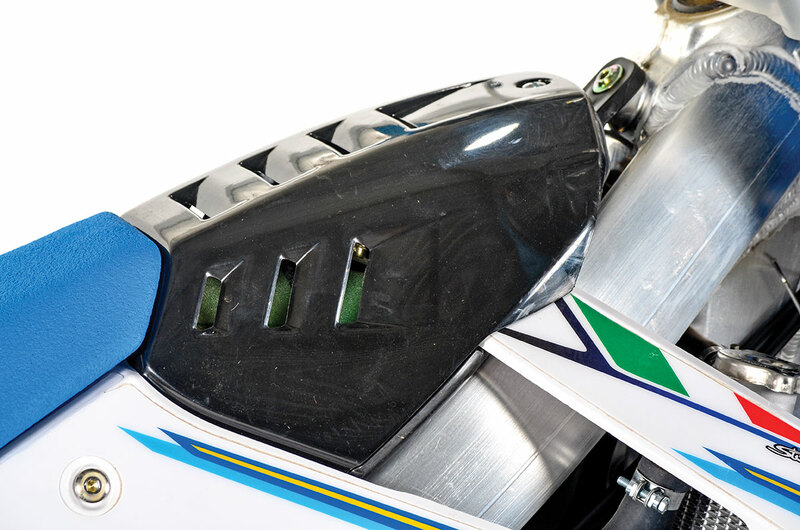 The air intake is located right behind the handlebar mounts, similar to current Yamaha four-stroke competition models. The 450FI Flat Track (FT) is not a motocross (MX) model with modified suspension, nor is it a Supermoto (SMX) model with dirt track tires. It can be called a hybrid of both models with some additional items that are only found on the Flat Track model. This fact is very apparent internally in the engine. The piston, intake cam, exhaust cam and five-speed transmission are specifically designed for use on the Flat Track model. The head features titanium 36mm intake valves and 31mm titanium exhaust valves. A 44mm throttle body, intake system and wiring loom off the SMX model are used, but EFI map settings are again specific to the FT model. The exhaust is also another item used solely on the FT model that is designed to enhance performance of the engine configuration. 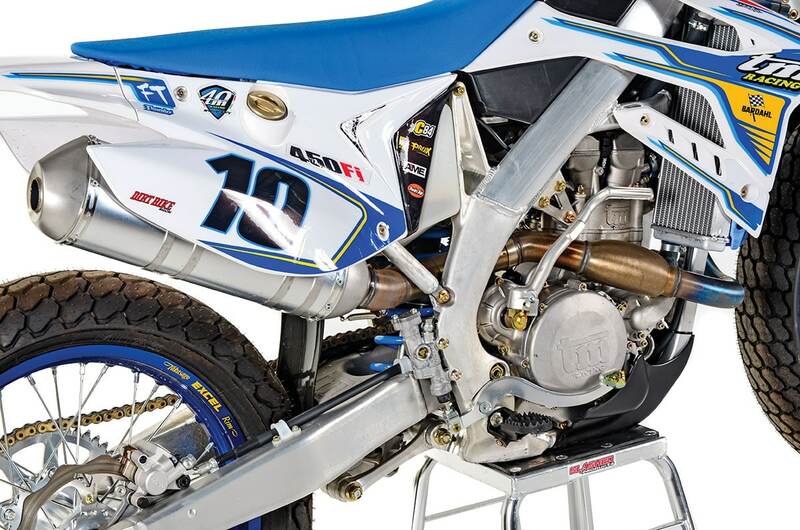 The exhaust is another item that will only be found on Flat Track 450FI and 530FI models. Chassis configuration is again a mix of multiple models. The linkage and swingarm are only used on the FT model because of their rate and different flex characteristics. 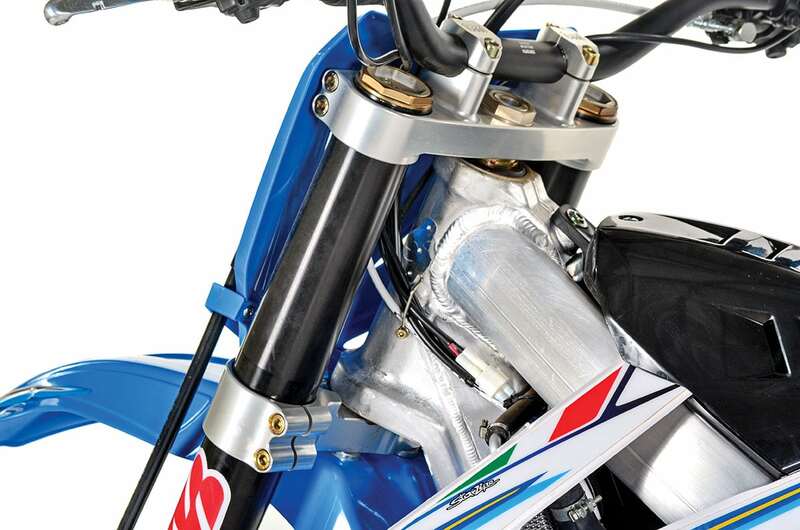 Just like on TM’s full-size MX, SMX and enduro models, the FT uses a shock built completely in-house at TM’s factory. The FT version is shorter with spring rate and internal valving specific to that model. Front-fork setup is handled by a Kayaba 48mm spring version, which is similar to what comes stock on the MX model, but shortened and internally configured for FT use. Triple clamps feature an offset only used on the FT model. Nineteen-inch wheels with polished alloy hubs and blue Excel rims are wrapped with Mitas tires on both ends. 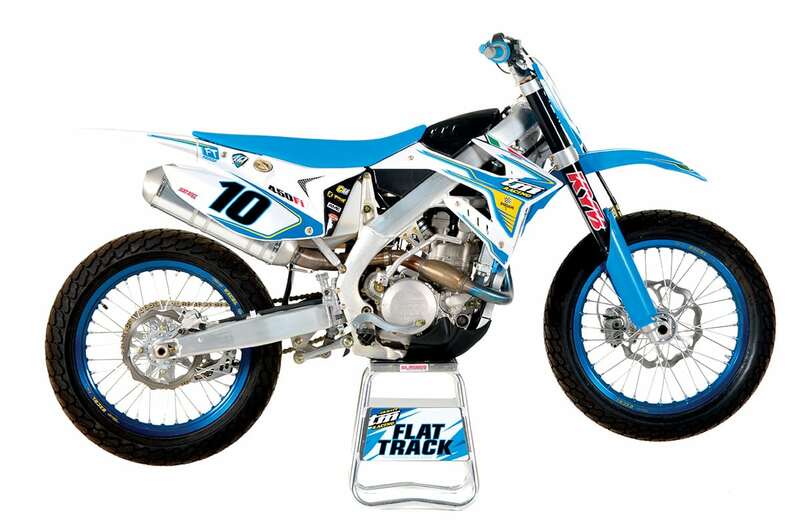 Engine-wise, the four-stroke Flat Track is a mix between their Supermoto, MX and Enduro models. Some internal items like the piston, cams and five-speed transmission are exclusive to the Flat Track machines. Overall layout of the FT model is very similar to other TM full-size four-stroke models, with the airbox intake located up by the handlebars and the gas tank under the seat with styling being identical. Stopping power is provided by Nissin in the rear with a Nissin master cylinder and Brembo caliper up front. In most racing organizations, the front brake must be removed. The FT also features a Brembo hydraulic clutch system. 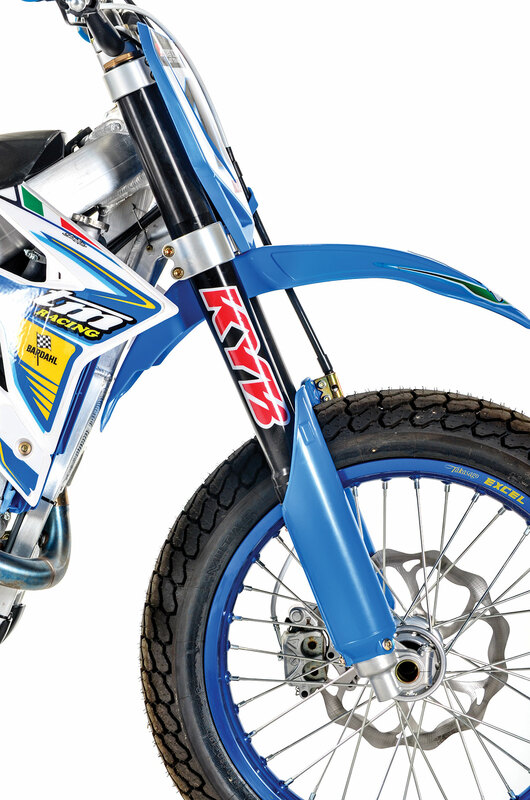 A lowered KYB 48mm fork setup is used on all the Flat Track models with a lowered shock built in-house at TM’s factory. Both of these components are found on other TM models but are highly modified for flat-track application. Flat-track racing is a very specific skill set, and we will admit, it’s foreign to everyone on the Dirt Bike staff. With that being said, we have to give credit to TM Racing for taking the time to build and offer a flat-track race bike ready to go right off the showroom floor. 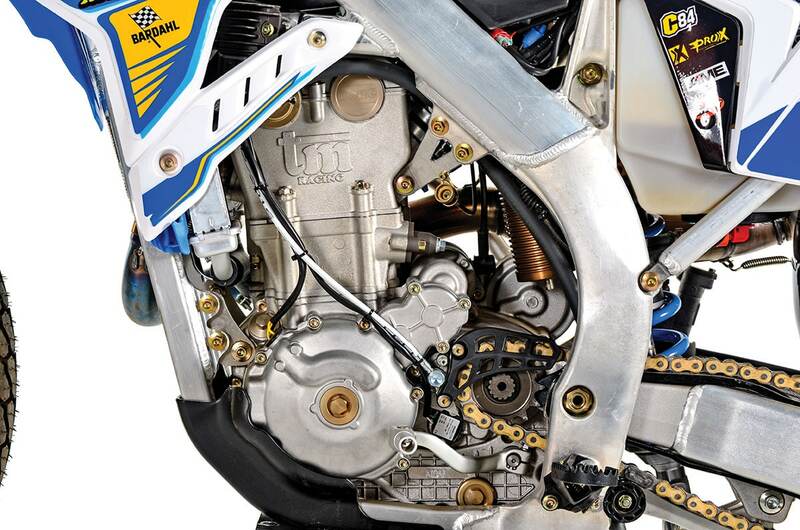 This is something almost unheard of for this type of racing, and TM offers a total of three different engine sizes in a flat-track configuration—450FI, 530FI and 300cc two-stroke. 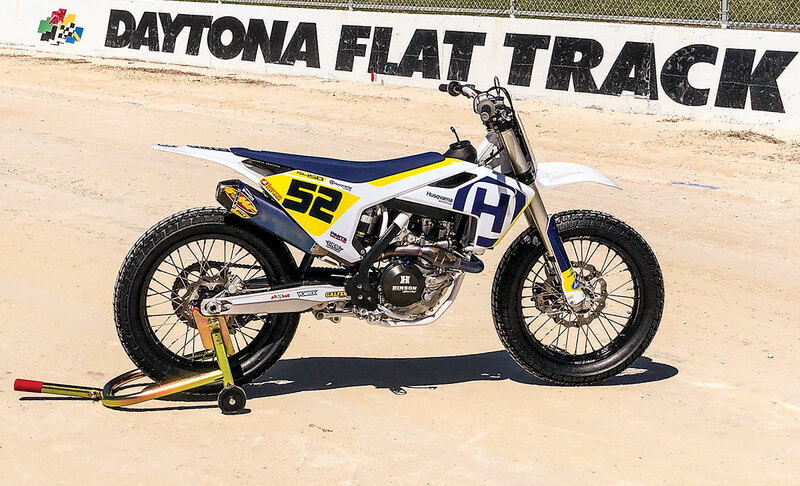 Husqvarna has put together a small flat-track effort with Shayna Texter for 2018. 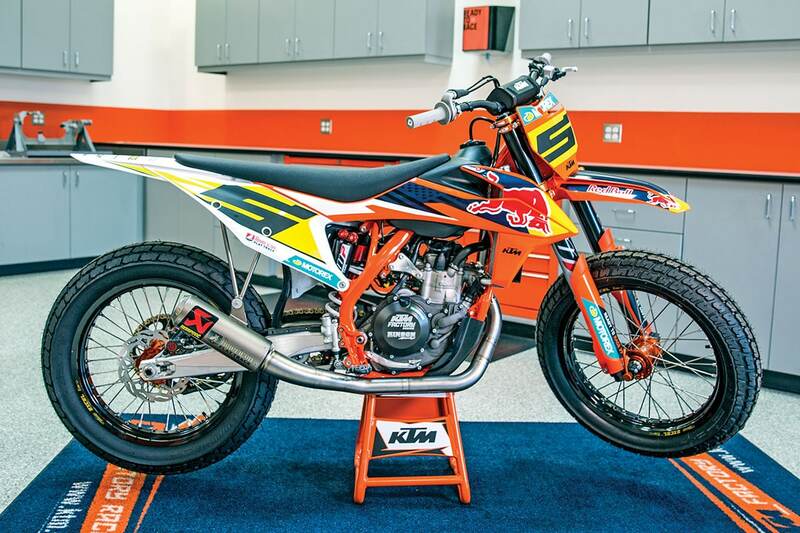 In 2019 KTM will have an official factory effort with Chris Fillmore. The machine is a blast to ride even for riders without experience and can do impressive things with an experienced rider at the control with minimal or no adjustments required. This actual machine is being raced at events around the United States by Rod Overstreet on a semi-pro level, and all he has changed are the suspension clicker settings and gearing for different-size tracks. That’s something you can’t say very often about racing a stock machine.